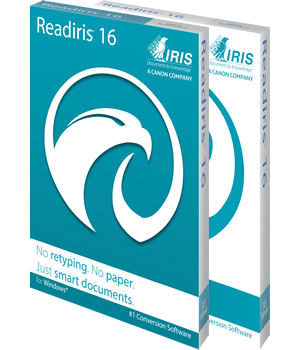 ReadIRIS will allow you to convert any paper document, image or PDF into editable and searchable digital files (Word, Excel, PDF, HTML, etc.) using Optical Character Recognition (OCR) technology. Simply scan your paper document using the built-in scanning wizard or import image from folders or digital camera. ReadIRIS will instantly convert it to the format of your choice without altering the original layout. Your digital documents will now be easy to edit, archived and shared! IRISDocument Server is an automatic, server-based OCR solution that can automatically convert huge volume of images into fully searchable, structured and hyper-compressed documents adapted for editing, short or long-term archiving. Thanks to the server-based process, users have access to OCR services that automate the conversion of unlimited volumes of documents non-stop! Affordable OCR software for Macintosh users using the latest version of the IRIS OCR engine. IRISDocument Server is a lower cost solution compared to recognition server, but lacks some of the more advanced features and has slightly lower accuracy. Several versions are available with varying monthly page processing limitations, letting you scale your solution to meet your budget requirements. Asian, Arabic, and Hebrew language packs are also available.